- Could you fill in the attached questionnaire? Please provide the IP details also. I work in Dr. Hales' Lab at McGill University. The reference number is 389794, and I think the distributor is Cederlane. I have arranged a free of charge vial of ab52175 to ship out to Cedarlane on their next order from us as a replacement for the faulty ab19870 that you ordered through them on reference number is 389794. When they get the new antibody they will send it to you, so please confirm your shipping address with Cedarlane. I've attached my western blots with this email. I tried your antibody twice. Lot number is GR63202-2. Not sure about the order number. Where can I find that? I did not perform an IP prior because it is impractical to collect the number of limb samples required for this procedure. 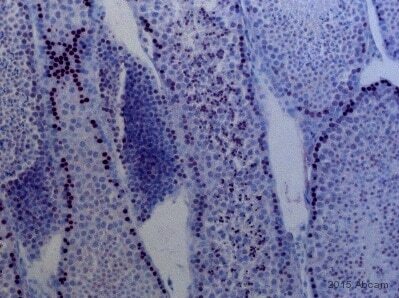 There limbs samples are from mice (GD12 CD1 pregnant). RIPA lysis buffer used. 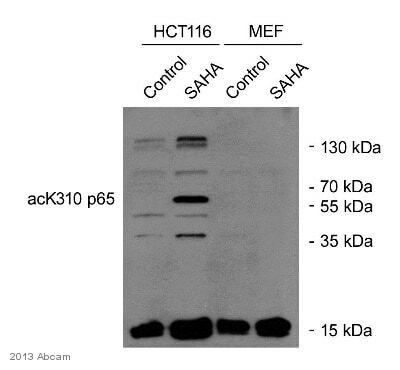 HDAC inhibitor (valproic acid) is administered during limb cultures in BGJB/salt solution for specific time points. The samples I used here is the 12hr incubation time-point. Samples are boiled @ 95oC for 5mins. Loading buffer contains B-mercaptoethanol. Each well contains 20ug of protein. Blocking buffer is 5% non-fat milk in TBST for 1hr before primary incubation. Thank you for your reply and for clarifying those additional protocol details. I may be able to look up your order details for you if you can provide more information. What institution are you working in? Did you order through a distributor? The protocol seems fine and as long as the antibody was purchased within the past 6 months I'd be happy to offer you a replacement or refund. I know that you said you'd be interested in trying ab52175, so please let me know your original order details so that I could work on getting that to you. Thank you very much for your interest in ab19870. To our knowledge,ab19870 has not been tested in IHC-P. Therefore, I can offer a discount off a future purchase if you buyab19870 now, test it inIHC-P and submit feedback to us in the form of an Abreview. It doesn’t matter whether the Abreview is positive or negative, we would just really like to receive your feedback. The discount would be to the value of 1 free PRIMARY ANTIBODY. 1. Reply to this e-mail to let me know that you would like to proceed and testab19870 in IHC-P. I will then send a discount code. This code must be issued before purchasingab19870 so please wait for my reply before ordering. 2. Purchaseab19870 either by phone, fax, or online (www.abcam.com). We are always pleased to obtain feedback about our products and any information is greatly appreciated! Even ifab19870 turns out to be unsuitable for IHC-P, you will still receive the discount on your next purchase after your Abreview has been submitted.